Brick House Traveler cigars are Nicaraguan puro’s made with the finest Havana seed tobaccos. The result is a mellow to medium-bodied smoke with exceptionally smooth and very well refined flavor. With savory notes of earth, cedar, spice, coffee, and a long creamy finish, the Traveler should be along for many a journey. Founded in 1895, the J.C. Newman Cigar company didn’t introduce the powerful Brick House until 1937. The authentic Cuban puro was made only with premium Havana tobaccos. The Brick House label is modeled after Newman’s family home and tavern in Hungary. Originally located in Cleveland, Ohio, the company now resides in Ybor City, Florida. Pronounced EE-Bor, the historical Tampa neighborhood founded in the 1880's, was (and still is) home to some of the finest cigar makers in the world. Ybor City is also known for many other cultural phenomena. One of them is called Guavaween. Guavaween, also known has the Big Guava, is an annual Halloween, Latino themed event. Similar to Mardi Gras, the Stumble parade held on the main street is led by Mama Guava and features floats, bands and people in costume tossing candy and beads to the crowd. If you’re ever in the area during late October the celebration is a must-do! Now back to the Brick House…. 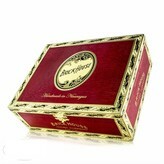 J.C. Newman exclusively uses the finest Havana wrapper and Nicaraguan puro filler tobaccos. The blend creates a mild to medium bodied smoke with notes of cedar, spice and toast with a subtle sweet finish. The Brick House Traveler is packaged in a very cool black and red tube sure to impress your friends. If you find yourself travelling the streets of Ybor City or partaking in the decadence of Bourbon Street during Mardi Gras, you can’t go wrong taking Sierra Nevada Porter with you. The ale has a medium body with caramel creaminess and makes for a great compliment to your Brick House. Relax and revel!